I love a great burger and I love bacon so when I saw that this was a combo of all my families favorites I knew we had a dinner winner!Sure it would be nice to think that we could always sit down with a nice hot dish, steamed vegetables, and a big tossed salad, but sometimes you just want a something that you can pick up with your hands and sink your teeth into. My husband used to own a small sawmill. It was great because he could make lumber what ever dimensions we needed. So one year I asked him to build me a big picnic table. One that we could fit 12 or more around. I know that sounds like a lot but when you have a family of 8 you are bound to have lots of your kids friends staying fro dinner as well. Which was a regular occurrence in our household. I loved that we could gather around our table with friends and family. Being able to serve up food that everyone loved was also a big hit. All you need now is a big bowl of potato salad and sliced watermelon and you are set for a great picnic. This is what Sabrina of Dinner Then Dessert has to say about this grand slam burger. 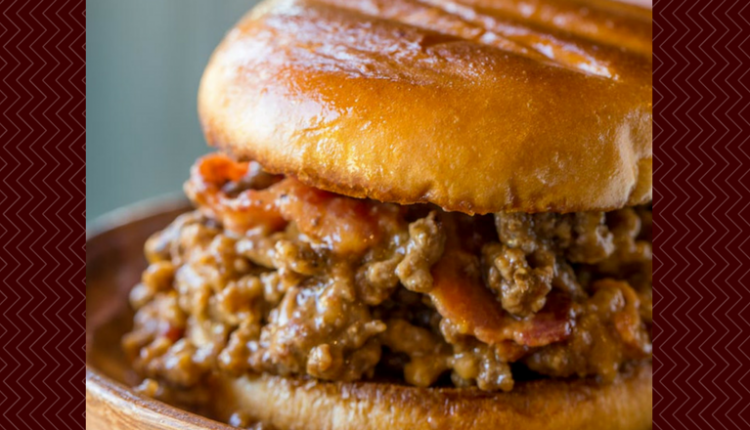 With the gravy and cheese mixture, the ground beef will be so delicious and sloppy you’ll forget all about that takeout bacon cheeseburger! Quick tip: Having a huge get together? Go ahead and make this up several days before the event! Just think, now you can check that off your list!